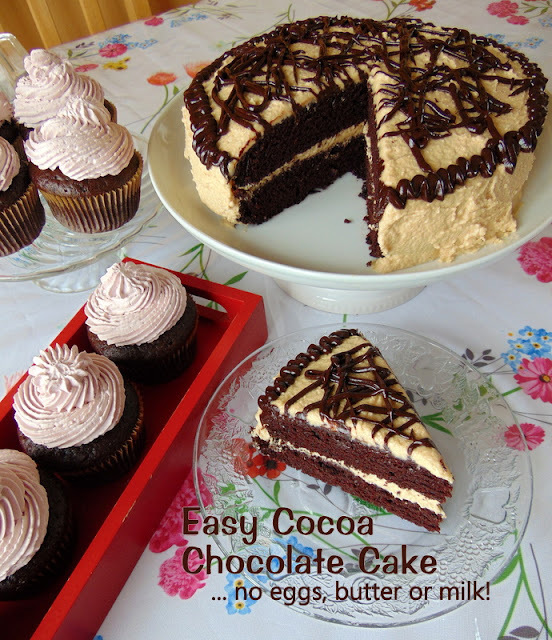 Easy Cocoa Chocolate Cake has no eggs, no milk, no butter! But this chocolate cake is better than you think! What kind of a cake is this, you might wonder, without the basic ingredients of any basic good cake? Well, it's an Easy Cocoa Chocolate Cake that you can whip up in minutes for any of your family or friends that may be vegan or have an egg allergy. And, certainly, it will feed your own sweet tooth quite nicely in times of an egg shortage, ha, ha. 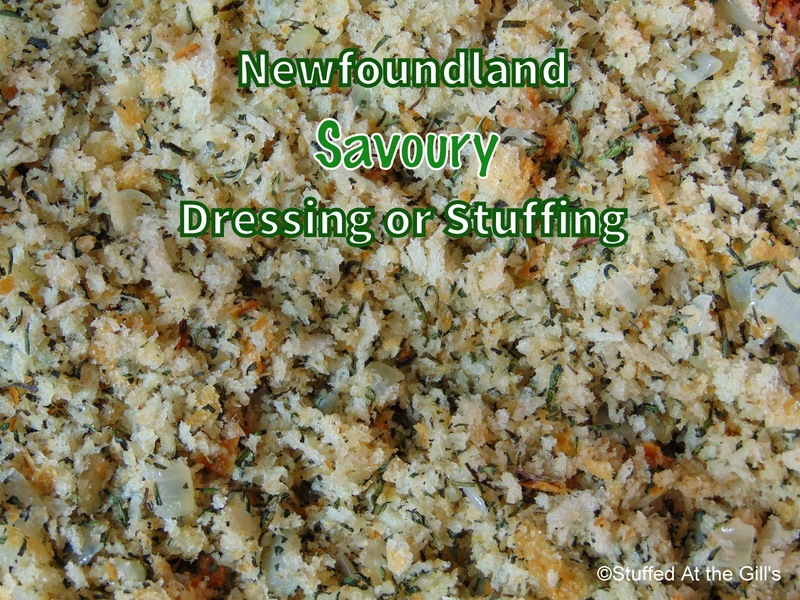 I've had this recipe for quite some time and have made it dozens of times over the years. 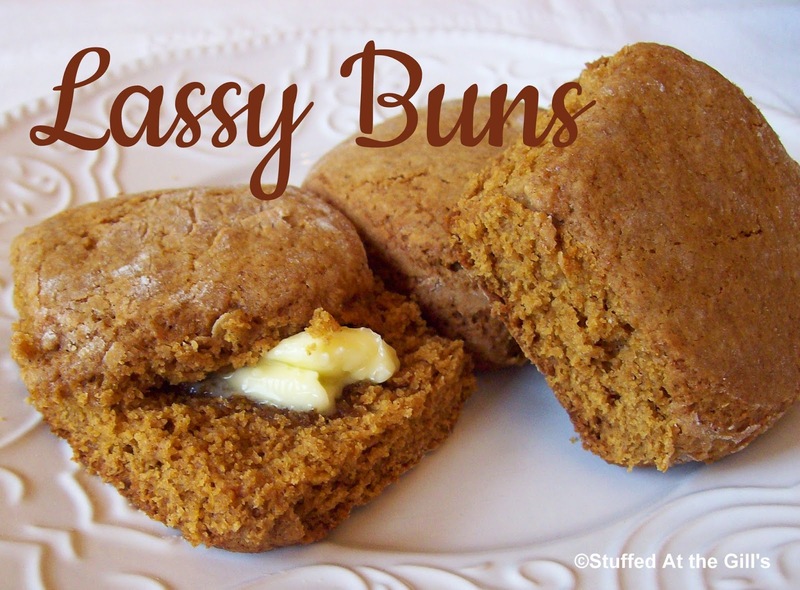 It was one of my go-to recipes when I was teaching school and wanted to bring a treat to the kids. It was practically allergy free, except for the occasional child who may have had a chocolate allergy. You'd be surprised how many children have egg and dairy allergies. But this is not the origin of this particular recipe for my purposes of obtaining it for my use. When my youngest son, Peter, was in his late teens he decided he was going to eat vegan. That threw me in a spin for a few minutes but I recovered and started looking for recipes we would all want to eat. I'm not one to make several different meals to please every palate at the table, especially for everyday dining. I'm a one-for-all kind of person. So I wanted recipes we all would enjoy and eat together as a family. 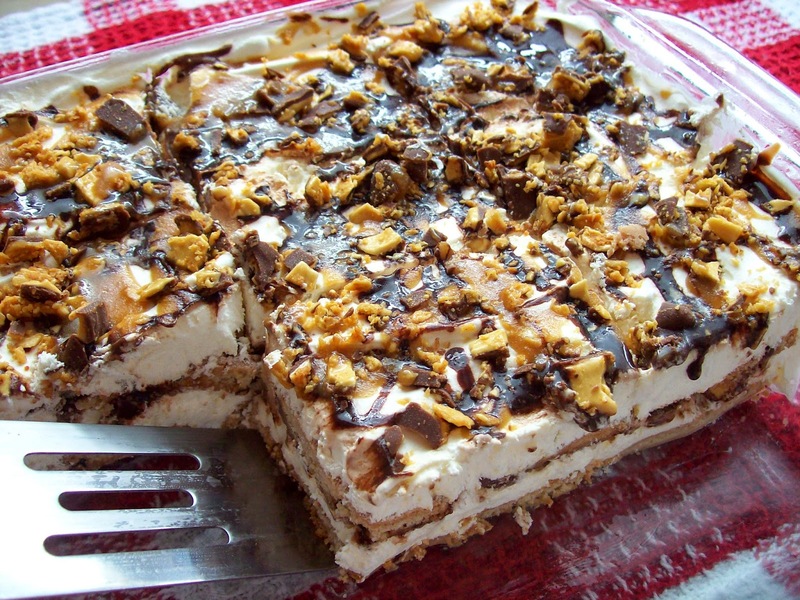 This is one of those recipes that I found. 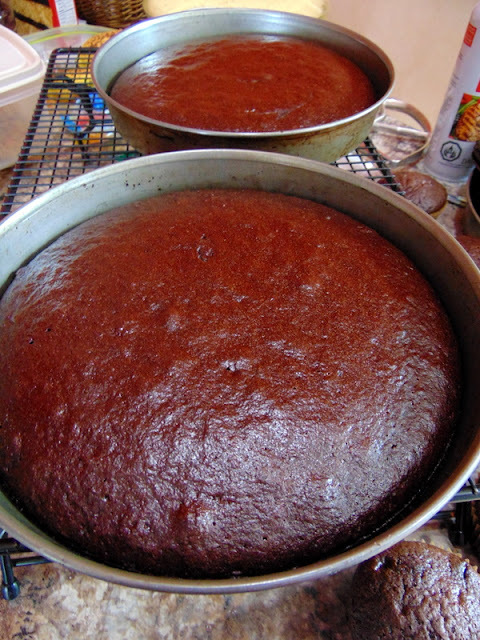 This Easy Cocoa Chocolate Cake came from a Greek Orthodox Church website that included recipes for lent. (The address for the site was never recorded as I never, ever thought I'd write a blog.) 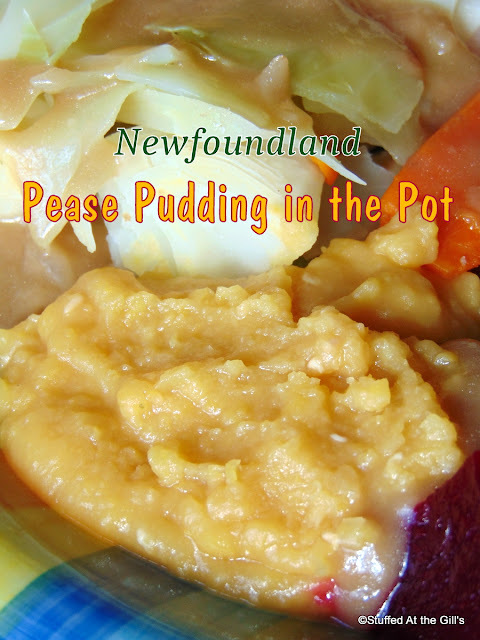 I figured if it was on a church website or cookbook it had to be pretty good. And I was right. It was good. It wasn't as good as a regular egg, butter and milk cake but it wasn't bad as cakes go. I've had worse made with eggs, butter and milk. Ha, ha. Anyway, it filled the gap in our dessert menu quite nicely and, as I've mentioned above, I've used it at school many times. But there was always one thing that bothered me about the cake and that was the slight unpleasant taste of baking soda that I could always detect every time I ate the cake. The ratio of baking soda to flour was not correct but without eggs it needed the extra leavener to help it rise. 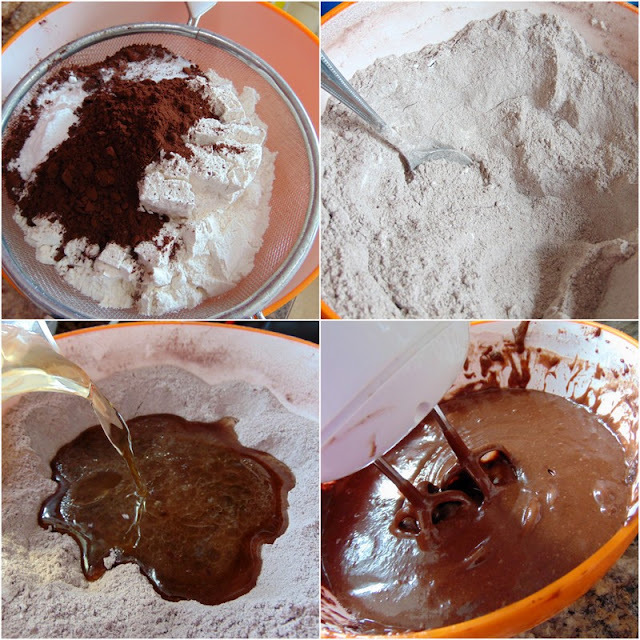 The correct ratio is ½ teaspoon baking soda to 1 cup flour and in this recipe the baking soda was doubled. I knew that was the problem but never bothered to fiddle around with the recipe until this past week when I decided to make it for my blog. David, my eldest son, and his family were visiting for Easter week when I made the cake. It's always nice to have a crowd around to help eat a large cake. As usual the cake had the baking soda taste and when I asked David for a critique of the said cake he very honestly told me it didn't taste like a real chocolate cake. Well, I knew that but his opinion only confirmed my own thoughts. So this morning I got busy while everyone was still in bed and started fiddling with the recipe. I added more cocoa, oil, water and vinegar. I decreased the baking soda to the proper ratio and included baking powder to the mix. I believe I have indeed improved on the original cake. It's still not quite the same texture of a regular cake, as the crumb is softer lacking the protein from the egg, but it's better than the one I've been making. 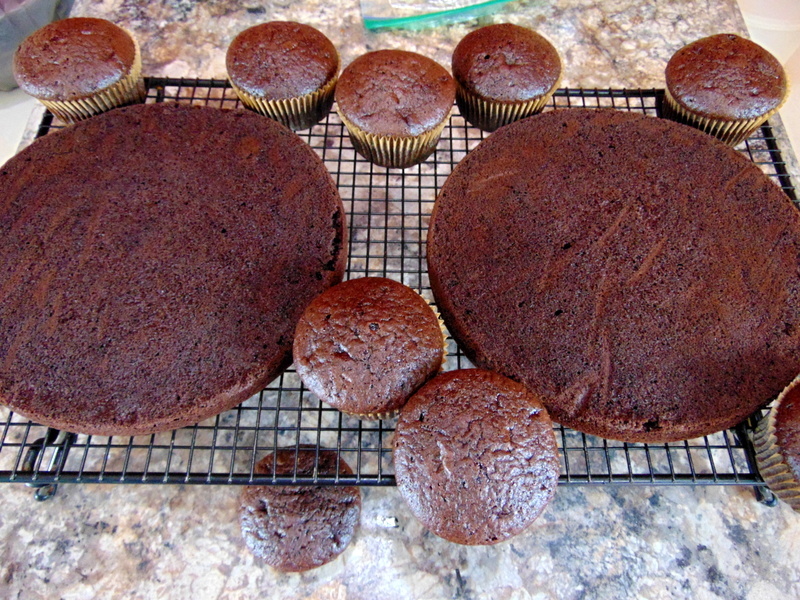 It's now a little less dense, more chocolatey, and best of all the baking soda taste is gone! Yeah!!! And I halved the recipe as it originally make a huge cake. 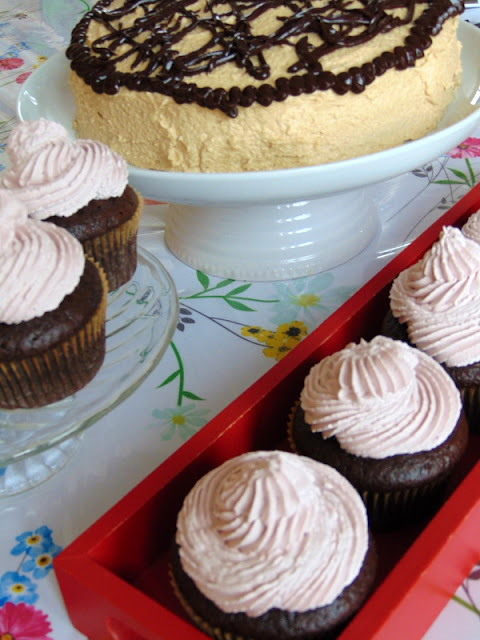 You can easily double the ingredients if you need a larger cake or more cupcakes. As with any homemade cake it is best eaten the day it is made but will be perfectly satisfactory for another day or two. Freeze any left-overs for another day. No eggs, no milk, no butter! This cake is better than you think. Preheat oven to 350 degrees. Grease and line with parchment or waxed paper two 8 or 9-inch round cake pans or line 18 cupcake pans. Sift together dry ingredients in a large mixing bowl. Completely combine all dry ingredients. Add oil, vanilla, vinegar, and cold water and beat together until smooth. 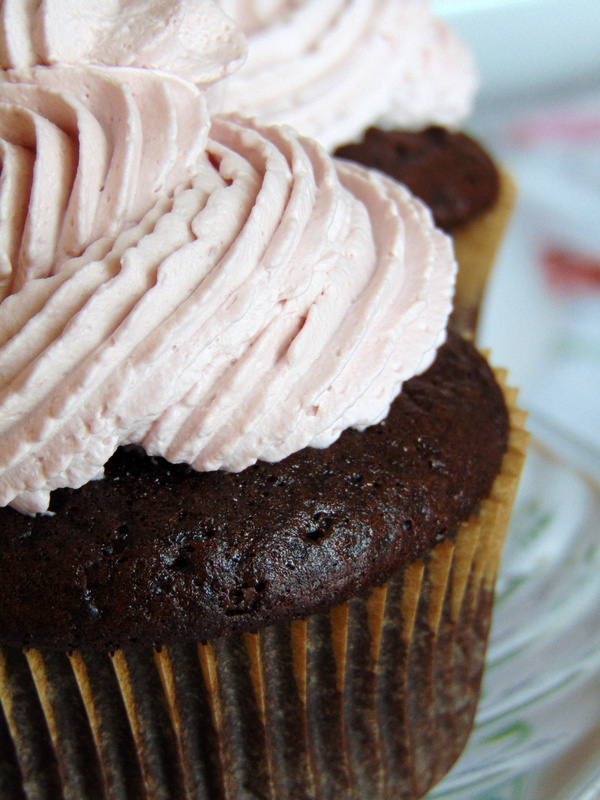 You may use a hand mixer or whisk to do this. Pour into prepared pans and bake. 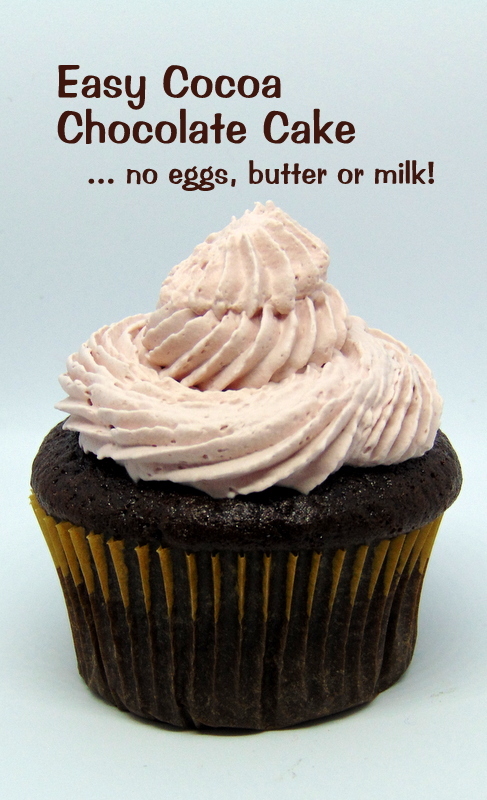 If making cupcakes use a scant ¼ of batter for each one. Bake layer cakes 25-30 minutes or until tester comes out clean; cupcakes 18-20 minutes. When baked, let rest 10 minutes in pans and then turn out on baking rack to completely cool. Store in covered container or freeze for future eating. Sift dry ingredients in a large bowl. Completely combine the dry ingredients before add the wet ingredients. 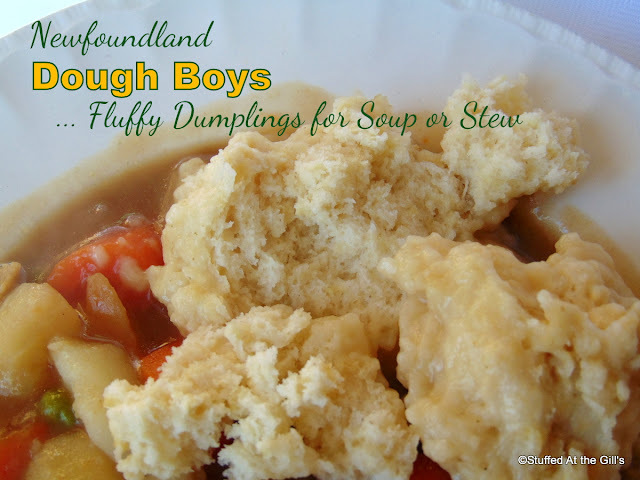 Beat with an electric mixer or hand whisk until there are no lumps in the batter. This won't take long. Line 18 cupcake pans with liners or grease and line cake pans with parchment or waxed paper. When cakes or cupcakes are baked let them sit in the pan for about 10 minutes. 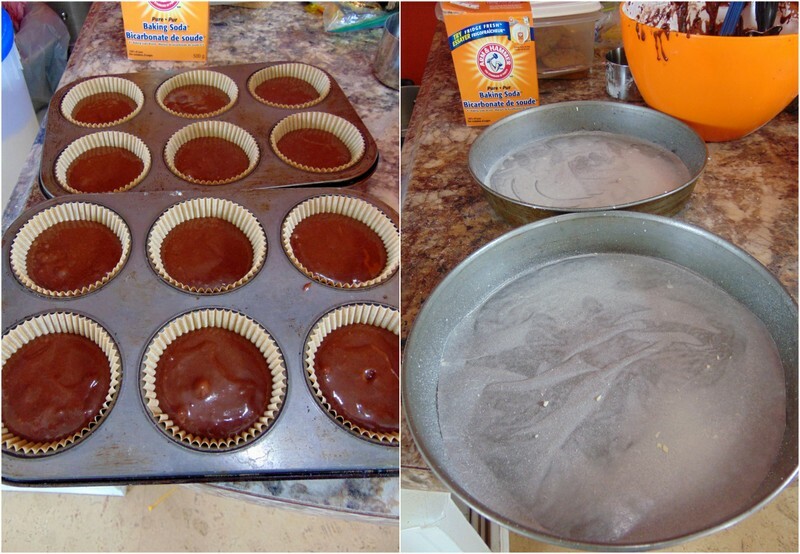 Remove cakes and cupcakes from pans and let cool completely on baking rack. When cool top with your favourite frosting. 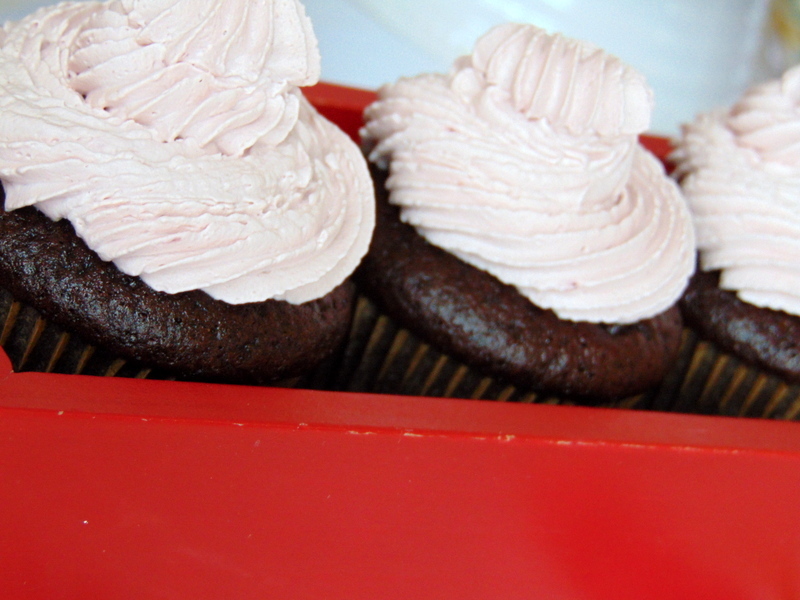 I piled raspberry whipped topping on the cupcakes. I beat a little seedless raspberry jam into the Nutriwhip I was making. As far as I can tell Nutriwhip is vegan. Nutriwhip can be found in most grocery stores in the cooler section by the eggs, milk and other refrigerated whipped toppings. I frosted the cake with a peanut butter icing. 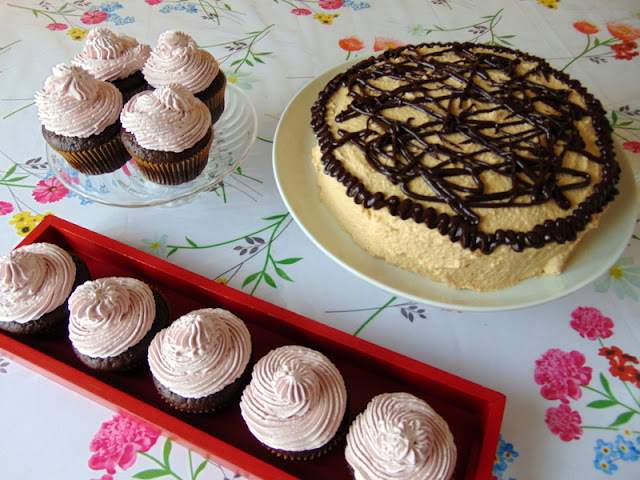 It's just a simple vanilla buttercream with a big dollop of peanut butter added to the mix. You can substitute vegan margarine for the butter in the icing recipe if you wish to keep everything vegan. Ben decided to have some of his dessert before supper. He seems to be enjoying the sample piece used for the photographs. 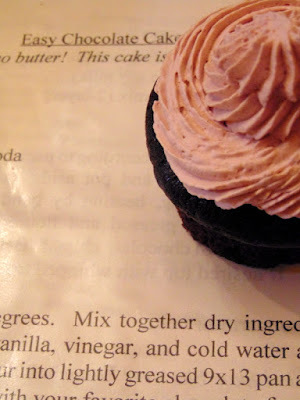 A double recipe will make 12 cupcakes and two thin layers. No eggs, no milk, no butter! This cake is better than you think. No eggs, butter or milk! This cake is better than you think! Great for people with allergies or for vegan diets.